June is here and weddings are in the air (all around us). June is the most popular month for Americans to get married. The second most popular month is October. There are many traditions in American weddings. One of them is related to what the bride (woman getting married) will wear on her wedding day. 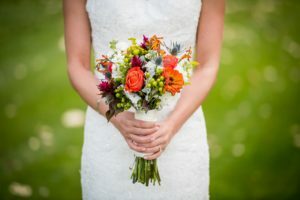 This saying – “Something old, something new, something borrowed, something blue” – tells the bride that she must wear these four things if she wants to have good luck for her wedding and in her marriage. What is the meaning behind each of these four things? “Something old” – This shows a bride’s connection to her past and her relationship to tradition or the old way of doing things. If a bride wears something old, the marriage will have longevity, or will last a long time. “Something new” – This shows hope for a good future. If a bride wears something new, the marriage will be happy, and be filled with joy or happiness. “Something borrowed” – This usually comes from another woman who is already happily married. The idea is that the borrowed item will give the new marriage some of the good luck and happiness that the married couple already has. “Something blue” – This represents love and fidelity (faithfulness and loyalty). It’s not clear why the color blue represents this ideal (principle). There are different theories. Some say blue was worn as a sign of faithfulness by Jewish brides, and the tradition continued from there, since the color blue was later associated by Christians with the Virgin Mary. Others attribute it to a custom related to preventing “evil spirits” from affecting the bride. Perhaps it was chosen simple because the word “blue” rhymes with the word “new” in this catchy (easy to remember) little rhyme (short poem with words at the end of sentences having a similar sound)! * This post was adapted from “What Insiders Know” from Cultural English 61. To see the rest of the Learning Guide, including a Glossary, Sample Sentences, Comprehension Questions, a Complete Transcript of the entire lesson and more, become a Select English Member. To be brutally honest with you team eslpod , in my book ,marriage is an idiotic institution. I m 100 percent unabashedly in favour of the dissolution of said institution. The most distant I could be. I mean I m not the only person in planet who thinks the binding contract fundamentally is null and void from the get go. And I m entitled to my opinion ,aren’t I? It is simply blue because it rhymes. man with the greatest luck of this usual wedding world. to me wedding or nothing. is the best I had in life. My mind it is just the same, I do not like weddings at all. exception and I have such a luck that it is unusual nowadays and before. You hear a lot of rhetorics about men as the powerful dominant species but in factuality, it is women who are in control. We can’t live with women, and we can’t live without them. It is quintessential catch 22 ,my friend. Hey, my brother used to say that women are in power. So i say, why female have to carry on all the stuff??? I mean, if I, as a woman, am the one who says what to do and how, I don’t ever notice it!! In this time and age ,Women call all the shots!!! to me ,what Emilio did takes courage!! the power that why are we going to say that. sky or doing silly things like going to watch the football match or similar things. love her absolutely, so why am I going to ask myself about it?. the power held in her hands I have been absolutely happy. wheel or not if I had an easy life for years. it is a secondary question. no other has any importance when you are living in this unhappy world. Mary Carmen, usually the one who make things, who makes nearly everything it is just that person who has the power in her hands because the other without her are really nothing. to pay being the Queens of the plot who manage everything round them. If a person, men, do nothing which kind of power are they going to exhibit?. Just when Cuca fall sick and I have to take house chores was the moment I could see which is the kind of power women have in their hands. Everybody are waiting to be fed depending absolutely from you woman or man in my case. When a woman is educated or taught a family is being educated. Not other saying is said about men. Thank you, Emiliano. I’d prefer not to have so much power and make fever things, however, as you said before… Luckily, my loved ones understand, encourage and support me in everything, so i am feeling much appreciated and happy. I also wish Warren a nice vacations.